All the exams are now over and hopefully everyone will soon be able to relax for their summer holidays. After the Euro 2016 I expect a lot of you will be watching Wimbledon and maybe enjoying some strawberries and cream! This month I thought it would be a lovely idea to interview my Grandma about her involvement in St Eustachius’ Church. My Grandma (Joan Stewart) was born in Tavistock and was brought into St Eustachius’ when she was six weeks old. She was baptised on the 8th November 1942 by Prebendary Bickersteth, who was the Vicar at the time. The first Curate she can remember was the Reverend John Delve and has known a great number since! She attended Sunday School each Sunday which was held in what is now St Rumon’s School, and still has her stamp books for attendance depicting the story for the Sunday. She was confirmed in St Eustachius’ on the 26th May 1957 by Bishop Robert Mortimore. Soon after this she became a Sunday School teacher and had to attend preparation classes every Friday night at 6:30pm! At this time there were about five girls and in Grandma’s words they all took a keen interest in the boys in the choir! Grandma met my Grandad (Malcolm) at a Sunday School party as the young men in the choir used to help out with the games for the children. Grandma said that following a bit of arm twisting they started up and ran the Church youth club which was known as the Path Finders; this was held every Wednesday night in the Church hall and they continued to do this for many years. Grandma and Grandad married in 1969 in St Eustachius’ and had three children. This is a tricky question as I have so many but if I really had to choose it would be ‘What a friend we have in Jesus’ because it is very upbeat and cheerful. Do you enjoying listening to the Vestry Group at the end of the service? Yes, I do thoroughly enjoy this as the children are the Church of the future and should be given every encouragement. I especially enjoy the plays which helps with their confidence. Do you have any ideas for what they Vestry Group could do in the future? I would like to see them perhaps having more social activities as this is always a fun thing to do. What is your favourite time in the Church’s year? This would have to be Christmas especially Midnight Mass because it reminds us that Christmas is not all about presents and food. But I also enjoy the Crib Service and seeing the children looking in awe at the real live baby and the animals! Last month was my 18th Birthday and I would like to take this opportunity to thank everyone who sent cards or Facebook messages. I had a lovely sunny day in St Ives and an enjoyable meal in the evening with my family. As I write this page the sun is shining and I have just come back from the ‘Party in the Park’. This was a very good way for all the churches to spread out into the community. A large number of people attended and seemed to have enjoyed the afternoon. I was born at a very young age, in London. My first home was in Blackfriars, then we moved to Lambeth. We lived there until I was about 10 or 11 years old, then we moved to Rye in East Sussex, then down to Devon when I was about 17. I have always been keen on music, and joined my first choir (St George’s Metropolitan Cathedral, Southwark) when I was 8, then when we moved to Rye I joined the choir at St Mary’s, where I began to learn the organ. I first began to feel a call to the priesthood whilst at St George’s, but first explored my vocation whilst at secondary school. It was about the time I was studying for my GCSEs; we all had an interview with the careers advisor to discuss our future. I told her that I wished to become a priest. I am not sure that she quite knew what to say or recommend, so she telephoned Lambeth Palace and I remember her passing the receiver to me and speaking to a nice gentleman there — not the Archbishop, I think! — and he asked me what I was interested in. He recommended that I focus on music for a bit, as I seemed to be enjoying that, then I could go forward for selection. That is, basically, what I did, but I focussed on my music for a while longer than anticipated (about 17 years!) before going forward for selection. I studied music at Exeter then Bristol universities, and was involved with lots of music, playing the organ or shaking my fists at various choirs and choral societies in Exeter and Taunton. I played mainly at Broadhembury, Payhembury, HMP Exeter (as a visitor, not an inmate!) and at Crediton. At university I was the organ scholar at the chapel there, then Director of Music at St Michael’s, Mount Dinham and Choral Scholar at Exeter Cathedral, before I returned to Crediton as Director of Music. Before I went to train for ordination at St Stephen’s House, I was a teacher at the Maynard School in Exeter. 1) How are you enjoying being a Curate in Tavistock? 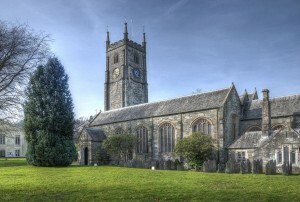 I am really enjoying living in Tavistock and serving as an assistant curate. Every day is different and there are lots of things going on at various times, and yet every day is begun and ended with prayer, providing a good, regular rhythm to the day too, which underpins whatever else is going on. Caroline and I (and Henry too!) have been made to feel welcome and feel very lucky to be here and in this friendly community. 2) How are you enjoying life as a Father? Being a father, like being a deacon, is not as bad and as terrifying as I had anticipated! It is an enormous privilege. Henry is a constant source of wonder and amazement—a great gift. 3) Do you enjoy listening to what the Vestry Group have done on a Sunday morning. If so, why? I do enjoy listening to the Vestry Group, especially when they sing something, or I can see their artwork. The Christmas show was excellent and I was very pleased to have been invited to take part in it. 4) Do you feel the Vestry Group have an important role within the Church? The Vestry Group is vital to the Church and plays a very important role—they are the future! They play an important role because they are an example to us slightly older ones. They are unafraid to question and explore the faith with joy. 5) Are there any ideas that you have for the Vestry Group in the future? More of the same, please…..reading, making, drawing, singing, acting, making us laugh….perhaps a day trip, to see the Cathedral or simply a walk and a picnic might be fun? 6) What do you do in your spare time? What do I do in my spare time? Sleep! I still enjoy music, I also read as much as I can and have just started dabbling in beekeeping. As for the future, I wish I knew more practical things about motor car engines and welding—then I might know how to look after my ageing Morris Minor better. I look forward to returning to all of my Church duties next month when my exam period will be finished. I hope everyone had a lovely Easter. Last month, I began another new role within the Church as a Server. This is a progression from starting in the Vestry Group at the age of three to now nearly being eighteen and having a more active role within the Church. This month I thought it would be a lovely idea to interview Mary-Jane Traber who has recently taken over the co-ordinating of the Vestry Group. Mary-Jane married her husband Max in St Eustachius’ Church on 16th April 1979 and they have two children; Lisa-Marie and Martyn. Lisa-Marie is getting married in St Eustachius’ this year. Mary-Jane has taught children from 0-16 during her career and retired from St Rumon’s in 2013 after nearly 23 years there. Her hobbies are amateur dramatics, attending Curves gym, reading and walking her dog. 1) How are you settling into your new role as the Vestry Group co-ordinator? It has been many years since I led a Sunday School group so I have been very fortunate to have the help, experience and support of Alison Boulter. She has kindly lent me resources and has led several sessions and meetings. I have a core group of people that have been supportive too, including Hilary Johnson, Mary, Martha and Lily Walke. 2) Do you think it would be a good idea to have more social events for the Vestry Group? If there is enough support for these I would be happy to organise them. 3) Do you think ‘Open the Book’ will encourage more children to join the Vestry Group? The Open the Book team have been going into St Rumon’s and St Peter’s to act out Bible stories and to ask the children to reflect on the meanings of these stories. We have been well received and find that it is an opportunity to encourage the children from our Church Schools to attend Vestry Group. 4) Have you enjoyed getting involved with Messy Church? I have welcomed the opportunity to meet and work with members of the congregation, other children and families. I feel I can use my skills and school experiences to good effect within Messy Church. It has been a fantastic experience and I am looking forward to the next session on 4th May. 5) What are your plans for the Vestry Group in the future? I have started a Reflections File that I will display in church to show other members of the congregation and visitors what we do in Vestry Group and how the children think and feel about the sessions. The children are very perceptive and are thinking about how they can use the teachings in their own lives and those of others. This may be followed by a Prayer File. I want to build on the enthusiasm of the children for Drama and to share more presentations in the church service. May is a month when the exam season starts and I would like to take this opportunity to wish everyone taking GCSEs or A-Levels every success. I will be taking my final A-Level exams so please include me in your prayers so that I can reach my goal of going to University and becoming a Primary School Teacher!